Flower Ornament Depository 華嚴藏: Where was Jibin 罽賓? The Han shu 漢書 – a history of the western or former Han dynasty compiled around 82 CE – provides details on a certain country named Jibin 罽賓 as one of many nations in the Western Regions 西域. As was common in Chinese dynastic histories, a section of the Han shu details the relative locations, customs and commodities of numerous countries as well as their respective relationships with the Chinese court. 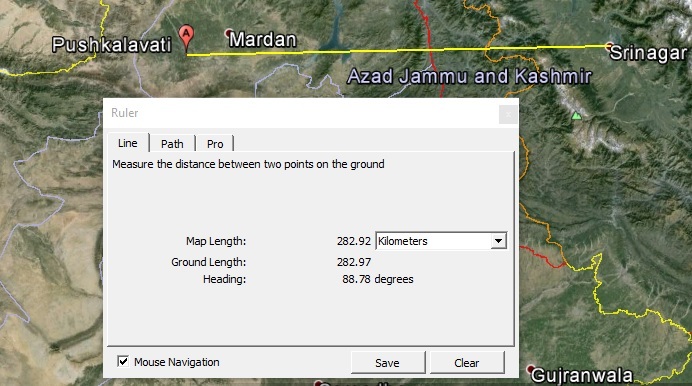 The text positions the Great Yuezhi 大月氏 to the northwest of Jibin, which means Jibin was somewhere in northwestern India. Long ago the Xiongnu destroyed the Great Yuezhi. The Great Yuezhi Western Lord [governed] Daxia while the Saka King the Southern Lord [governed] Jibin. The Saka peoples scattered and became numerous countries all over. The identification of Jibin has thus been important in reconstructing the Buddhism taught and practiced in northwestern India in these early centuries, especially in the large absence of materials from India itself. Modern scholarship on Buddhism often heavily depends on Indian literature translated into Chinese as well as Chinese accounts of India. Chinese materials are thus quite important to the study of ancient India in the first millennium CE. Tibetan materials only become available from around the seventh and eighth centuries. This country of Jibin was thus an important source of Buddhism in China early on, but where was it? The capital was Xunxian 循鮮城 as it was rendered into Chinese. The modern Japanese scholar Shiratori Kurakichi 白鳥庫吉 (1865–1942) believed this was the ancient capital of Gandhāra, which is Pushkalavati in modern Peshawar. However, the Sinologist and linguist Edwin Pulleyblank (1922–2013), who specialized in the reconstruction of old and middle Chinese, identified Jibin as “*Kaspir for Kashmir.”1 Pushkalavati is about 280 km from modern Srinagar in the Kashmir valley. As Enomoto notes, “Previous studies have showed that Jibin indicated Gandhāra up to the beginning of the 4th cent.”2 Kāśmīra and Gandhāra are strictly speaking separate regions, though they are relatively close to each other. This brings to mind the possibility that travelers to China from this general area identified it *Kaspir. In the Eastern Jin (317–420) and Northern and Southern Dynasties (420–589) periods, Jibin was at least in some cases very clearly identified as Kāśmīra. The Abhidharmakośa-bhāṣya 倶舍論 (T 1559) translated by Paramārtha 眞諦 (499–569) translates Kāśmīra as Jibin 罽賓, whereas Xuanzang 玄奘 (685–762) phonetically transliterates Kāśmīra into Chinese. Enomoto's work however notes that “Ji-bin found in the works of Chinese Buddhist monks between the 4th and 6th centuries indicated a wider area including Kashmir, Gandhāra and possibly Tokharistan, that is to say, the whole of north and north-west India.”3 This therefore requires one to be cautious in assuming that Jibin must refer to Kāśmīra simply because Paramārtha translated it as such. Ancient Chinese geography was only approximate and based on hearsay rather than on objective surveys. 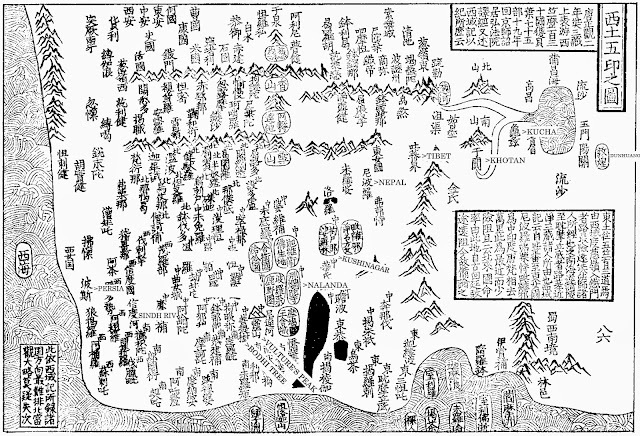 Just as an example, consider the following map in a later historical account of Buddhism, the Fozu tongji 佛祖統紀 (fasc. 32), by Song dynasty monk Zhipan 志磐 (1220-1275) which provides a map of the regions west of India based on Xuanzang's account. The map notes it is only approximate. 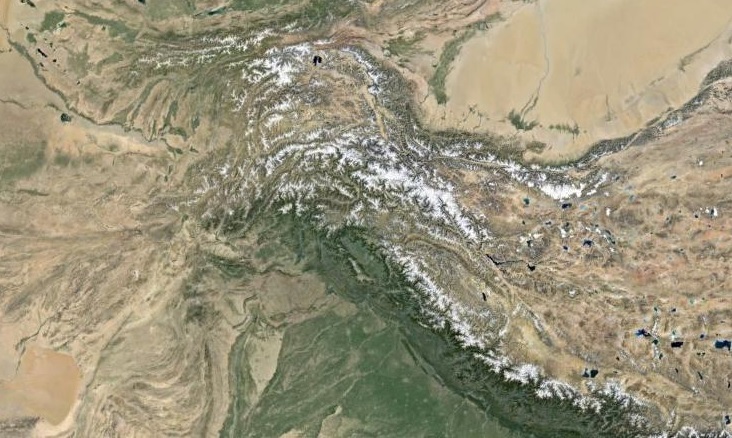 Note that the Himalayas are on the right, the top represents Central Asia and the bottom right is SE Asia. The sea is the Indian Ocean. The country of Jibin is west of Śrāvastī. The king and people all venerate the Buddha. Religious practitioners and śramaṇa-s in the winter drink a little alcohol before noon. After noon they do not eat again. This brings to mind the issue of wine consumption in India (see here) and in particular Falk's research on wine production in Gandhāra by Buddhist monastics. This account might indicate that monks in Kāśmīra also consumed wine at least ostensibly in the winter. This shift westward away from Gandhāra is noteworthy. As is well known in Buddhist Studies, by the time Xuanzang visited in the seventh century, many old Buddhist sites were in ruins and the religion was visibly in decline. The collapse of Gandhāran Buddhism and the migration of Buddhist monks along with Buddhist trading routes to outlying areas due to Brahmanical colonization and hostility is something Verardi has discussed (see here for the paper).5 Curiously, the Sui shu 隋書 (fasc. 83) – the history of the Sui compiled in 629 – identifies Caoguo 漕國 (*Zabula) as the Jibin of Han times. As Verardi notes, Zabula continued to host Buddhist communities while the religion was attacked elsewhere.6 Monks from 'Jibin' visiting China might therefore have been coming from even Zabula rather than Gandhāra and Kāśmīra. In other words, the seeming 'westward shift' of the definition of Jibin perhaps reflects the movement of Buddhist clergy over time due to external pressures. If Verardi's thesis is correct, this westward movement of Buddhist centers was caused primarily by hostility from Brahmanical traditions and the nobility which supported them. Much later the understanding of Jibin's location changed again as the Ming shi 明史 (fasc. 332) – compiled in 1729 – identifies Samarkand 撒馬兒罕 as Jibin! 1 E.G. Pulleyblank, “The Consonantal System of Old Chinese. Part II,” Asia Major 9, part 2 (1962): 218. 2 ENOMOTO Fumio, “A Note on Kashmir as Referred to in Chinese Literature: Ji-bin,” in A Study on the Nīlamata: Aspects of Hinduism in Ancient Kashmir, ed. Yasuke IKARI (Kyoto: Institute for Research in Humanities, 1994), 357. 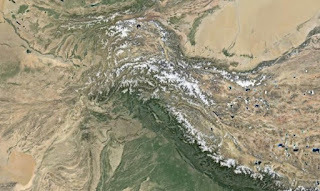 5 Giovanni Verardi, “Buddhism in North-western India and Eastern Afghanistan, Sixth to Ninth Century AD,” ZINBUN 43 (2012): 147–183.